When I was in high school, senior year, I made the plans that I was going to go to a college about 2 hours away and live in the dorms with my best friend. I had no idea what I was going to major in, I had no idea how I was going to earn any money, and I honestly had no idea about life. The closer and closer that it became closer to May, the more I panicked. I have had anxiety all my life, and this big of a change wasn’t going to go unnoticed. My counselor kept asking me if I had applied for the colleges I wanted to get into, assuring me with my scores and all that I could get in to them and even get scholarships. I kept procrastinating. And procrastinated. I didn’t apply for anything. Until finally I made the split decision to apply for a local college, closer to home that I happened to work at. That way I could stay home, work, and be in my familiar territory. It wasn't because of my best friend, who went on to do super awesome and I'm still so proud of her. In fact that was part of my anxiety of worrying if she would be mad at me if I didn't go. My fear of the unknown has held me back on many things, and it’s one of the things I am currently trying to work more on. 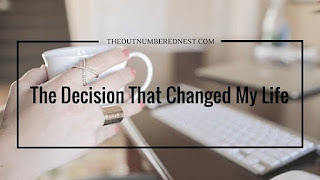 That one decision is what took me down to what is my life path now. It was the simple decision that lead to me having my beautiful monkey man, then my beautiful buggy and leading me to my beautiful (or handsome if you prefer the masculine term) husband. It was how I met my other best friend that introduced us. What would have happened if I would have went to the college hours away. Would my group of friends be different, would I have an awesome career? Or I often wonder if I would have one child, no children, or more. Would I still be single, enjoying the nightlife? Or would it have taken a darker turn? Would I have been miserable and suffered even more from my anxiety? I can’t say what the outcome would have been, and I can’t change the facts now. But I do know that that was the one major decision in my life that made a huge impact on my life. It was the one decision that now looking back on it, how happy I am that I made it. My husband was made for me and if I had left for college- I probably would have never met him. Many decisions have shaped my life, making me who I am today. I’m not ashamed of them, and I wouldn’t take them back. It’s fun to ponder just how different I would be. What is the one moment in your life that changed your course of your life history? Is it a happy moment, sad moment, or possibly a moment that you didn’t even consider being important at the time?